This recipe is sponsored by Pompeian. Their range of extra virgin olive oils and organic vinegars are staples in my kitchen and I am thrilled to bring you this easy weeknight dish in partnership with them. I am a big fan of chicken and those of you who follow me on Instagram are probably aware of that but let's face it...sometimes it gets a little how can I say? Boring? Lately, there has been an influx of amazing products that make it easy to transform a humble bird with the flavors and fragrances of faraway places. Deep, savory Middle Eastern flavors are so popular right now and for good reason. Amazing spices and blends like hawaij, ras el hanout, berbere, sumac and sauces like zhug liven the palate and make people at the table go "Wow!" I can get behind that. If we are going to eat chicken AGAIN let it be bold in flavor and even better, let it be quick to prepare. If you can prep the bird a day ahead of time and let it soak in that marinade, this recipe will only take about 45 minutes start to finish in your Instant Pot. That includes coming to pressure (5-10 minutes) and releasing pressure naturally (10 minutes). This is a more realistic time than recipes that promise a 15 minute start to finish process. Thankfully you can walk away from an Instant Pot and prepare sides, pour yourself a glass of wine, fold laundry (maybe not) or set the table while you take in the intoxicating aroma of Hawaij Chicken cooking. Hawaij - A Yemenite Spice Blend mostly used for soups and stews, but don't let that limit your experiments! What is Hawaij? 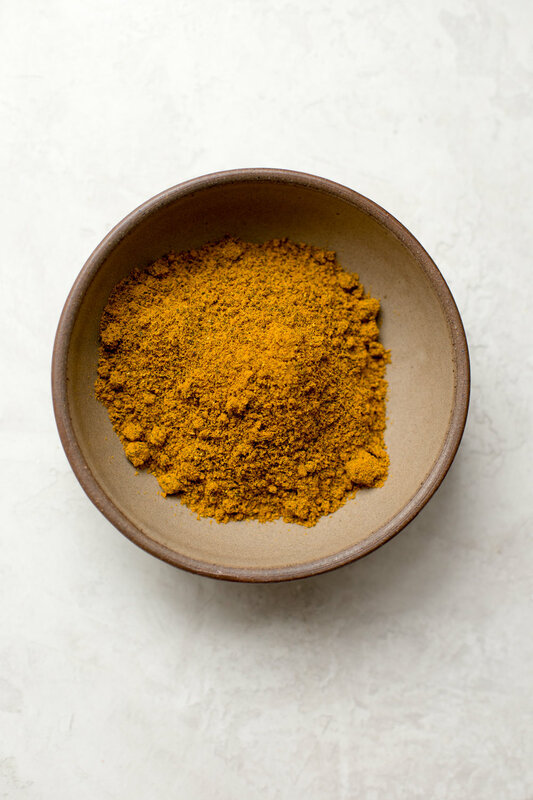 A Middle Eastern spice blend that often includes a mix of turmeric, cardamom, black pepper, cumin, coriander and sometimes clove. You can purchase it online or make your own, I'll include an easy basic recipe below that you can customize to suit your taste. I love combining it with Pompeian Robust Extra Virgin Olive Oil, especially when going the non-traditional route of using it as a marinade. Bold flavor needs a stronger oil. Combine Pompeian Robust Extra Virgin Olive Oil, Hawaij spice and salt in a small bowl. With your hands, rub the marinade onto the chicken to season every inch, inside and outside. Ideally, this step should be done a day ahead of time to ensure an evenly seasoned bird. Turn the Instant Pot on, making sure that pressure is set to HIGH. Place sliced onion and garlic in the inner pot and cover with stock. Place chicken on top of the onions, breast side up, then close the lid and set the valve to "sealing." Set the timer for 18 minutes. The Instant Pot will come to steam a little and then seal, starting the timer. Prepare the salad by combining all ingredients in a small bowl. Cover and place in the refrigerator. Once the timer on your Instant Pot beeps, allow the pressure to release naturally - Do not manually release the pressure valve. When the pressure gauge drops, remove chicken and serve whole or cut into pieces. I like to place the chicken on a baking sheet or tray and crisp it up in a 450F oven set to "broil" for 5-8 minutes. The gravy created in the Instant Pot while cooking the chicken is delicious poured over the bird, especially when served with rice. Sprinkle chicken with toasted almonds and optional salad.